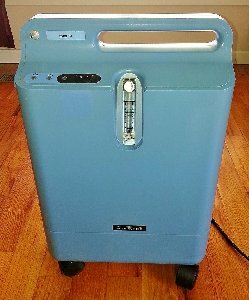 Respironics Everflo Oxygen Concentrator is designed to be small, light, easy to transport and will fit into the trunk of a car. It features interface panel with on or off switch and alarm indicators, and easy-to-mount humidifier bottle connection and no patient filter. Its molded handle is easy to pick up and transport with one or both hands. The small nature of the unit and the minimal number of parts within gives the EverFlo Oxygen Concentrator the Green Seal of approval. Along with the green product label, The Respironics EverFlo Portable Oxygen Concentrator is the unit to get if you want a long-lasting, powerful, and cost effective option for your oxygen therapy. Less space, less parts, less fuss!